Magnetic Rotary Separator is used to remove the ferrous contaminants from the material that is apt to caking and bridging. These materials, like power with high moisture which is certain viscous, is easily to cake using fixed magnetic separators. However, the rotary action will scatter the material and make more contaminants attracted on the rods. This unit embodies unapproachable capacity compares to other fixed separator. 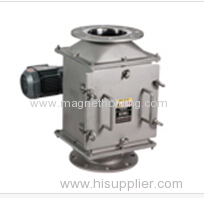 Rotary Grate Magnetic Separator consists of a cyclic magnetic bar group and a housing outside. A motor is necessary to drive the magnetic rods rotating. 1. Finishing: Fine polishing and well welding to meet food grade. 3. Magnet: High strength rare-earth Magnet. 5. Type of mounting: Round and Square, flange and quick release clamp are decided by customer..
6. As rare earth magnets are extremely powerful and tramp metal is very difficult to remove by hand. We are ready to offer you an easy-clean design. 7. Motor: Please offer requirements like IP, Voltage, Frequency if possible. 8. Customer designs, specifications can be fulfilled. Products are of some moisture, a little viscous that have bridging problems. In order to ensure perfect performance, it has to check periodically. Once it needs to clean, please shut down the power. Then release door latch, draw out the magnetic core and do the wiping. Use extreme caution and wear gloves during the process. How to select our products? Please advise us the above necessary information to make enquiry. If you aren't in a position to offer these information, please feel free to contact our engineer and acquaint us with the application environment and material condition.